Last month I was commissioned by Blackpool Council Arts Service to photograph five new Blackpool public artworks for their promotional postcards and permanent records. ’These artworks consisted of a WWII soldier sculpture in Salisbury Woodlands, The Choir Loft next to the war memorial near North Pier, The hoardings around the site of the old Yates’s Building, illumination artworks on Dale Street and a number of installations (including the ‘The Wave’ sculpture) in the newly re-developed St. John’s Square in Blackpool’s town centre. ’The Wave’ is a 10.5 metre high sculpture designed by the artist Lucy Glendinning, which forms part of Blackpool Council’s regeneration plans to create new high quality public spaces for residents and visitors to enjoy. The sculpture features an illuminated colour-changing pattern in cast resin, reflecting the stained glass windows of St. John’s Church. 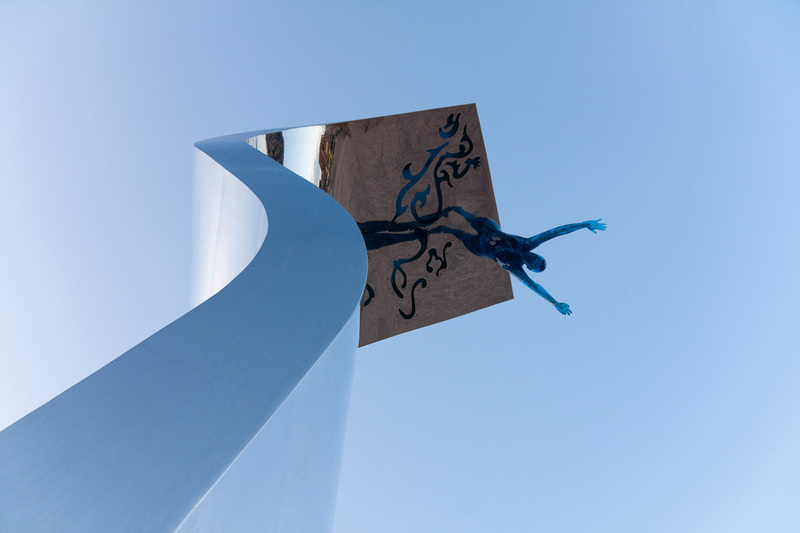 A 2.5 metre diving figure, secured with metal rods hidden inside the sculpture, springs from the main polished stainless steel structure and references Blackpool’s coastal heritage and history. The highly polished mirror finish provides a ‘hall of mirrors’ type effect that ensures ‘The Wave’ looks different from every possible angle. Five giant pebbles cast in clear resin also surround the sculpture that light up in various different colours. This £500,000 sculpture is part of a £4.7m makeover of the town centre that is funded by the NWDA (North West Development Agency) and Townscape Heritage Initiative. The plaza, now open to the public, includes decorative granite setts, new plane trees, column lighting, plantings, and computer controlled illuminated water fountains. 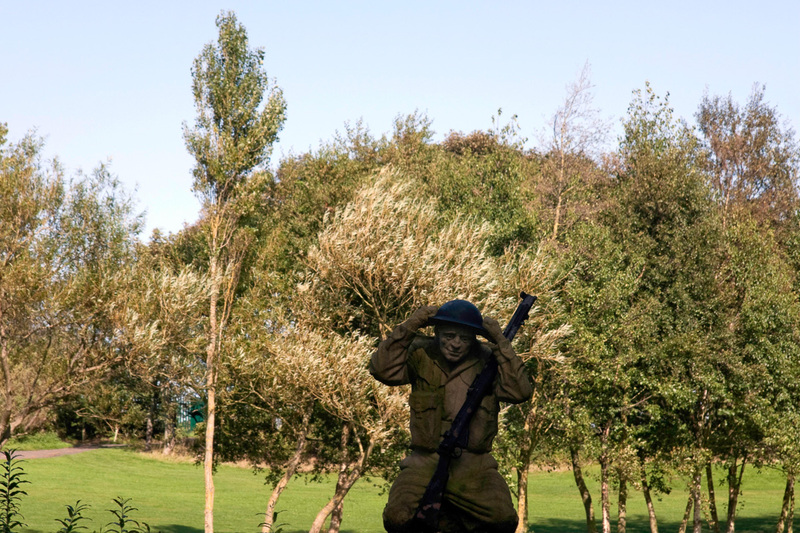 ’This WWII Soldier Sculpture in Salisbury Woodlands near Blackpool Zoo also required some thought and consideration in order to get the best photograph out of it. The sculpture is placed upon a pillbox in a densely wooded area and was built as an anti-invasion station during World War II. Needless to say, the army didn’t build this pillbox in a brightly lit area. I went back to this location several times to get the best possible light and my persistence finally paid off during my fourth attempt to photograph this soldier sculpture. I think the trees in the background compliment the overall tone and texture of soldier, while also giving some context to where the photograph was taken. In the photograph above, I tried to use the cafe and street signs to provide a context for the artworks that I think makes for a rather interesting juxtaposition. You may not to see it in this particular photograph, but each artwork has a central circle that has a different backlit photograph of Blackpool which is framed by a sculptural seagull motif. 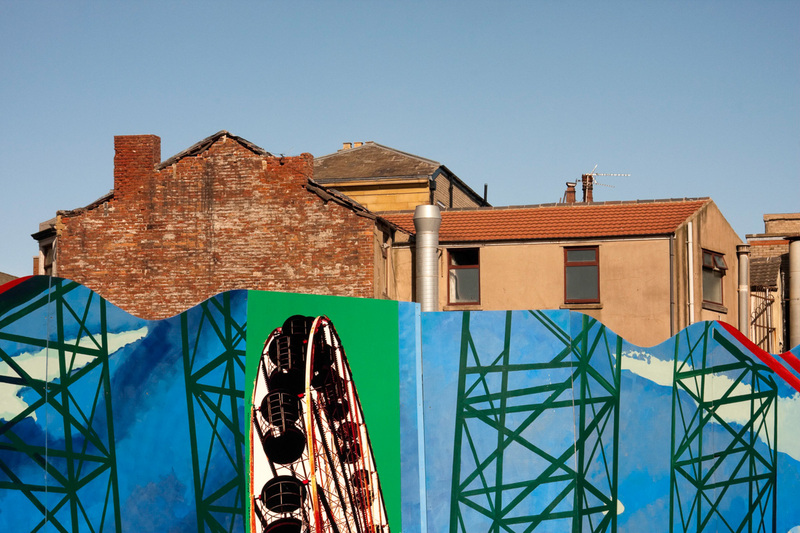 The ‘hoardings’, a colourful installation consisting of eighty 1.5 metre panels by the artist Sarah Galloway, is a £20,000 project that surrounds the site of the old Yates’s building in Talbot Square that was burnt down on the 15th February 2009. Each panel is inspired by photographs of iconic Blackpool buildings and also features text from Blackpool Council’s current poet in residence John Siddique. Some of the panels are hand painted by the artist while others use digital photography on acrylic discs. Reaction to the panels is mixed, with some people branding it a waste of money, while others say it is key to the resort’s regeneration. The Choir Loft is a contemporary memorial to those who struggle for freedom in all conflicts. It is a functional monument to the act of resistance and the importance of memory, and has been designed to compliment the existing Cenotaph near North Pier. The aim of the work is to provide a space for contemplation and reflection for visitors. On ceremonial days it will host public celebration and memorial through song. The memorial takes the form of a Choir Loft that is a permanent space for a choir to sing, positioned so that the singers face the existing Cenotaph, and beyond that, the sea. 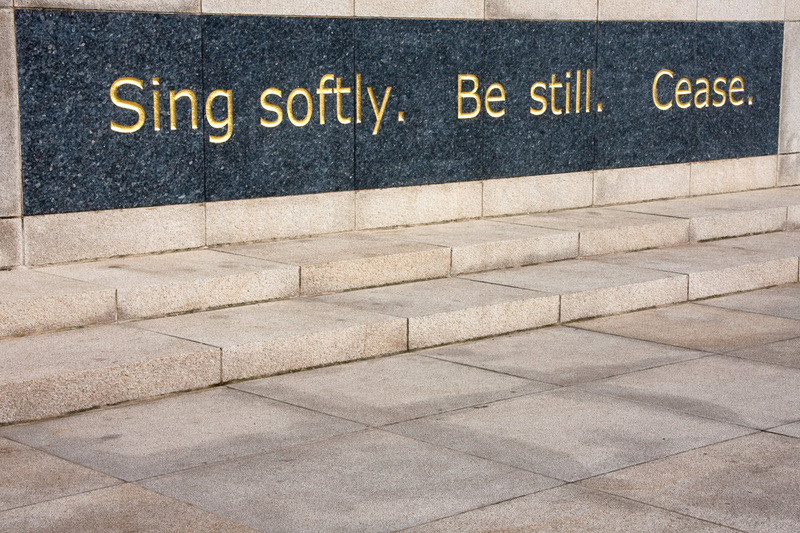 The memorial is faced in white granite, with a contrasting band of blue granite into which the words ‘Sing softly. Be still. Cease.’ are written. 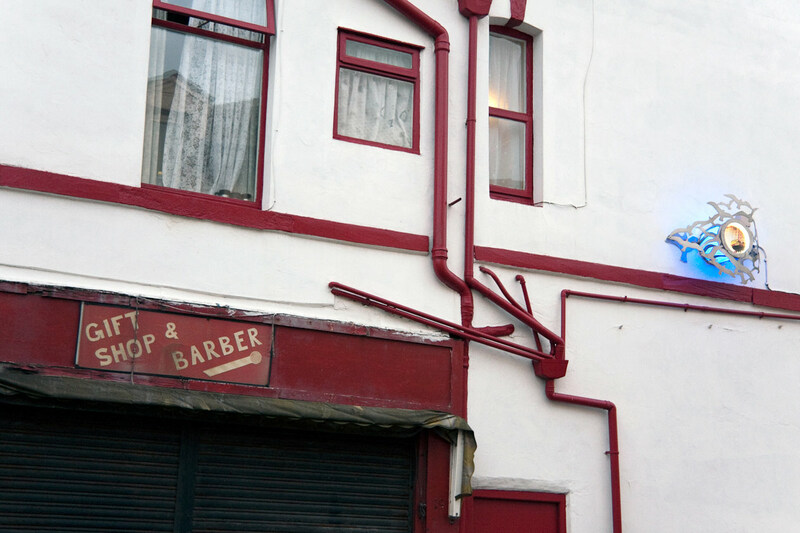 This entry was posted in Commission and tagged Blackpool, Blackpool Council, Commission, Public Artworks, Sculpture, The Wave. Hello, I’m Yannick – a professional freelance photographer celebrating ten years working in the photography industry. Based in Lytham St Annes, Lancashire, I'm committed to bringing you lovingly crafted photography services from the heart of the Fylde coast and beyond. Copyright 2019 © Yannick Dixon. All Rights Reserved.